(Nanowerk News) A major new research project - lead by the University of Dundee - has been launched with the aim of helping make offshore wave energy a sustainable proposition. Sustainable offshore wave energy has the potential to make a real contribution towards the binding European Union commitment to source 20% of its electricity requirements from renewable sources by 2020. The vast wave energy resource along Europe's western seaboard is unparalleled anywhere in the world. Consequently the EU has an opportunity to become international industry leaders in what is becoming a rapidly evolving and dynamic marketplace. 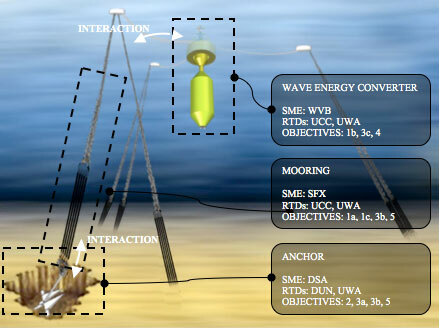 However, technical and economical hurdles associated with anchoring wave energy devices to the seabed threaten to stall and limit the impact that renewable wave energy has the potential to deliver. Consequently the offshore renewable wave energy industry has collectively identified "mooring and anchoring systems" as a research topic of immediate relevance and priority. The 'GeoWAVE' project has been launched to address this issue. Lead by the University of Dundee and funded with 1.1million Euros from the European Union FP7 programme, the project also involves the University of Western Australia and University College Cork, together with a number of small to medium-sized enterprises (SMEs): Lloyds Register, Seaflex AB, Deep Sea Anchors, Wavebob Ltd and Cathie Associates. Objectives of the project are: 1. To investigate the most suitable mooring configurations and components for Wave Energy Convertors that will minimise seabed footprint, motion impedance of the Wavebob WEC and anchor loads. 2. To provide performance data for a new generation of technically efficient anchors that will quantify expected anchor geometries for a given mooring configuration, water depth and seabed profile. 3. To utilise the new performance data from Objective 2 to develop and calibrate design methods for anchor installation, in-service performance of the moorings and anchors and an integrated station keeping tool for the WEC. 4. To utilise design methods from Objective 3 and performance data from Objective 2 to develop costing methods for mooring and anchoring Wavebob WECs at a particular site, permitting an economical viability assessment. 5. To conduct offshore testing to collate field data and verify design methods from Objectives 3 and 4. "There is great potential for wave power to be a valuable source of renewable energy but if it is to be realised we have to make it robust and cost-effective," said Dr Jonathan Knappett, Senior Lecturer in the School of Engineering, Physics and Mathematics at the University of Dundee, who is co-ordinating the project. "One of the big challenges facing the industry is how wave energy convertors can be safely attached or anchored to the sea bed. Currently this accounts for around one-third of the production costs of convertors. That cost needs to come down if they are to be used within a fully commercial wave farm. "If we can reduce the costs associated with station-keeping, then it will go a long way to making wave power an energy source that we can harness more effectively." GeoWAVE aims to address this immediate research need by conducting industry-specified research on a new generation of offshore anchors and mooring components deemed to have the highest economical and technical merit for mooring wave energy devices. By doing this, GeoWAVE will remove the technical and economical hurdle of mooring wave energy converters to the seabed so that widespread deployment on a commercial scale becomes viable. The new knowledge generated by the project will be fully assigned to the SME partners in the project, thereby providing new business opportunities. The new approaches generated within GeoWAVE may also benefit other types of offshore green energy solutions such as floating platforms for offshore wind turbines. The consortium will apply complementary methodologies in numerical, analytical and experimental modelling combined with field trials to increase the understanding of the combined response of the system and to develop economical and practical design solutions for the wave energy industry.